After Saturday night's romp over Real Salt Lake, D.C. United is off to their best start to a league season in a decade. Seven goals scored and zero goals conceded has yielded seven points against Atlanta United, New York City FC, and RSL — all playoff teams from 2018. 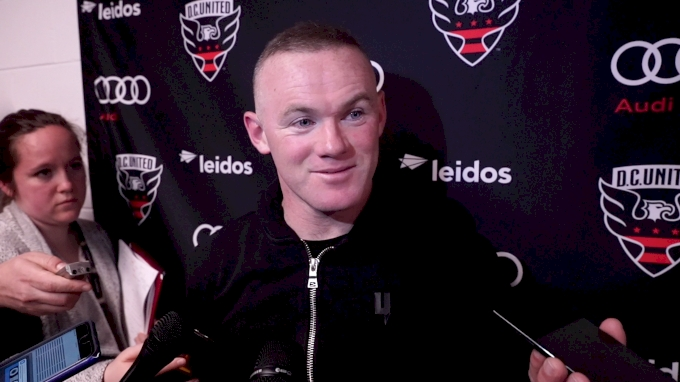 Wayne Rooney opened his account for the season from the penalty spot, and then didn't stop shooting — and scoring — until he secured his first MLS hat trick in the 5-0 win. United enter the international break tied atop the Eastern Conference with the Columbus Crew, and they're the only team in the league to not concede a goal. One more shutout — against Orlando City on March 31 — and the Black-and-Red will tie the league record for clean sheets to start a season. As impressive as United have been all over the field, it's their defense that has shined the brightest, a far cry from what was happening this time last year. Here's what stood out to us from United's second win of the season. Last September, United dismantled the Montreal Impact 5-0 at Audi Field. United didn't jump their foes in the playoff race that night, but they basically showed that the jump was inevitable. That result as a bit more impressive than Saturday's, only because RSL finished the game with nine men. Jefferson Savarino was sent off for raking Luciano Acosta's face with his cleats just before halftime, and 20 minutes into the second half Marcelo Silva picked up his second yellow for hauling Lucas Rodriguez down on his way to goal. Those two red cards ensured what was already inevitable: United were going to win, continuing their dominance at Audi Field. It's the second game of the season surrounded by qualifying circumstances. Against Atlanta, maybe their opponents were more focused on their Champions League game that was several days later. And against RSL, a quarter of the team was in the showers early, making life that much easier for the Black-and-Red. At the same time, United were ahead 2-0 when Savarino got sent off. D.C. didn't start off the best, but they took advantage after Paul Arriola won a penalty, and then doubled their lead before the intermission. Then came the red cards, allowing United to add three more goals, taking their goal differential to plus seven on the season. There wasn't any worry that Rooney had gone the first two games without a goal to start the season. Last year, it wasn't until the fourth game that he scored against the Colorado Rapids. Rooney had only managed four shots over the first two games, which might have been more of a sign that teams were having a bit more luck shutting him down, or that he was more willing to play provider instead of finisher. But on Saturday night, Rooney took an incredible 11 shots, five of which were on target, in securing his first MLS hat trick. After the game, Rooney said he was worried when he missed his open header early in the second half, that he might not get the third goal. He wouldn't be denied, though, thanks to Acosta and Junior Moreno. "To score a hat trick is always great," Rooney told reporters after the game. His opener came from the penalty spot, sending Nick Rimando, known for saving penalties in MLS, the wrong way. The second was a brilliant chipped finish after a feed from Leonardo Jara. RSL were all over the place defensively when Jara tackled the ball away to win possession, but Rooney still expertly got Rimando to commit before chipping it home for his second goal. Rooney tried to complete his hat trick from midfield, then hit the crossbar from the sideline on a free kick to close the first half. His missed header in front of goal was his biggest miss of the season, but he was right in front of goal to receive the pass from Moreno to finally complete the trick in the 65th minute. "Those guys don’t like to come out of the game," Ben Olsen said after the game when asked if he thought about taking out Rooney after his hat trick. "He was playing well, and he looked fit." From there, Rooney would only go on to add his second assist of the season, but more about that goal below. Since Titi's arrival on loan from Estudiantes in the winter, D.C. United have been high on Lucas Rodriguez. After a quiet preseason, hampered by an injury, Rodriguez had a good debut against Atlanta. There were flashes of what he can bring to the team, but he just didn't have the final ball on the opening day. Last week, Titi didn't have as great of a game, but chalk that up to the playing conditions at Yankee Stadium. Rodriguez was having another solid game on Saturday night until he scored this goal, announcing his arrival to the league with this wonderful volley. It requires boatloads of technique to score a goal like that. And apparently Titi has that ability in his locker. "We’ve been asking him to have that in his bag of tricks," Olsen said after the game. That goal came with RSL down to nine players, but it was Rodriguez who got Silva sent off in the second half as he made his way towards goal beyond Real's back line. Those are the types of chances that he needs to convert for United, but he was denied the opportunity to do so by getting hauled down by Silva outside the box. If he can convert the ridiculous, though, that's just the cherry on top for the young Argentine. "In order for him to have a real impact with this group, it’s about what he does between the 18s, but also inside the 18," Olsen said of Rodriguez. "We are relying on him to fill up some of those numbers we had last year with Yamil and other guys."